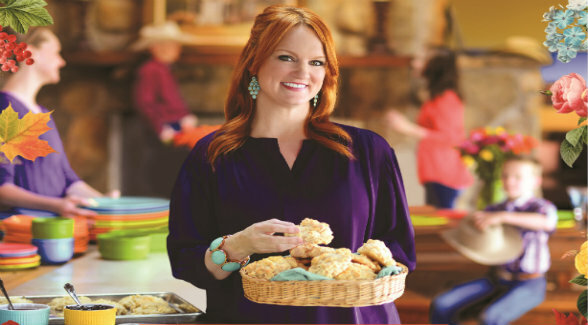 Coming to a bookstore near you … The Pioneer Woman Cooks! Don’t walk outside at night without shoes on. Buy groceries in bulk. Get satellite Internet. Check your gas gauge before you leave town. Wake up early and watch the sun come up. Enjoy the quiet. Ree happened upon her future husband, Ladd Drummond (a.k.a. Marlboro Man), at a smoky Oklahoma bar while out with girlfriends. Visiting from LA, where sushi and pedicures were her norm, ranch living was as foreign as life on Mars. But after their wedding in 1996, followed closely by the birth of the first of their four children, she had no choice but to learn the ropes. Her new life was filled with early morning calving missions, cooking meals from scratch, and wrangling children, along with rodeos, pickup trucks, manure piles, horseback riding, and the occasional Rocky Mountain oyster feed. Through her writing and photography, and that satellite Internet access she prizes, Ree was able to bring others into her newly discovered world. And in a time when authentic ranchers are an endangered species, this world has appealed to women from every background. With more than 23 million page views per month, Ree’s self-proclaimed transition from Black Heels to Tractor Wheels (the title of one of her books and a soon-to-be movie) is obviously intriguing. Her readers seem drawn in by her unique fairy tale-esque story, her pioneering perseverance in becoming a ranch wife and mother, and perhaps a glimpse of a life that seems so utterly simple, so authentically American, and so wholeheartedly connected to the land that has now become her beloved home. “I think all of us women yearn for a simpler life, particularly when we have kids and schedules and demands all around us. The country seems simpler to a lot of people,” Ree explains. But her blog, because of its popularity, has actually pulled her away from the land she has become so attached to. With book tours, a Food Network show, and interviews on any number of other TV shows, she is busier than ever. But when her wheels hit the gravel road that leads to the Drummond Ranch, she always lets out a sigh of relief. And what does she do when she reaches the ranch after time away? “The first thing I do is leave my suitcases in my pickup; sometimes for a couple of days! The next thing I do is hug all the creatures on the homestead: my husband, the kids, the Basset hounds, and I sit outside with my kids to breathe in the air. Then I go inside and open the fridge because I’m usually ready to cook something!” she says. 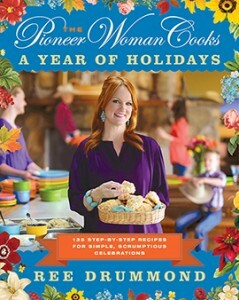 What’s cooking in Ree’s household now is her third cookbook, The Pioneer Woman Cooks: A Year of Holidays: 140 Step-by-Step Recipes for Simple, Scrumptious Celebrations that’s due to be released by HarperCollins this fall. A look at Ree’s favorite holidays throughout the year and the cuisine that accompanies them, the book hits the stores just in time for Thanksgiving and Christmas. And for Ree, these times are golden.